Margin trading is a powerful tool for accelerating portfolio growth. Margin trading is best suited for short-term scalpers and daytraders. Due to the daily interest rate and the possibility of volatility-induced liquidation, margin-positions should not be held long-term. Margin trading can be an emotional rollercoaster, so be sure to keep your emotions in check and always use a stop loss. Margin trading can easily catch out inexperienced traders who jump into it without any prior knowledge. But the reality is that margin trading can be a hugely profitable tool when used correctly. It takes time to learn the craft, however, and margin trading should not be undertaken without a solid understanding of the fundamentals, along with risk management. In this post, we’ll dive into the nuts and bolts of margin trading, how to properly use leverage, and how to implement margin trading into your overall trading strategy. 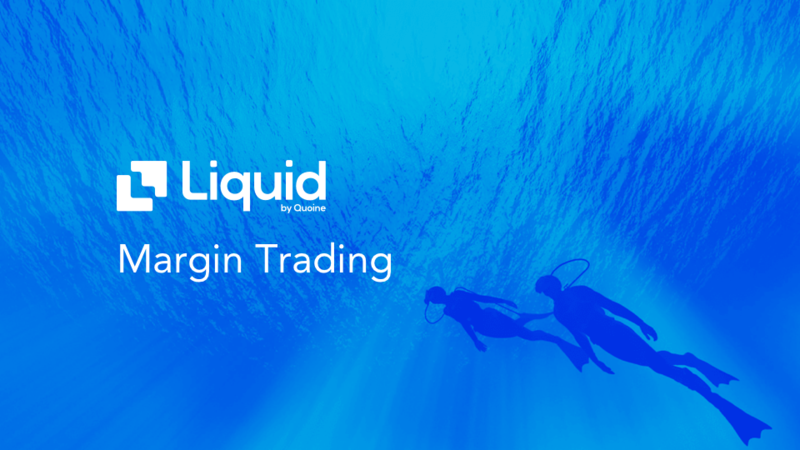 Liquid supports two forms of trading: spot trading and margin trading. Spot trading only allows traders to buy and sell self-owned assets. If you’re looking to buy the QASH/BTC pair, you must have BTC in your exchange wallet. Similarly, if you want to sell QASH/BTC, you must have QASH. Unlike spot trading, margin trading does not require you to own the assets you wish to trade. Instead, you can deposit funds to your margin wallet to be held as collateral. With this margin, you can borrow assets from lenders to trade with. For example, depositing USD500 to your margin account allows you to open a USD500 QASH/BTC position without actually owning any QASH or BTC. Margin refers to the actual amount of funds you deposit into your margin wallet. With this margin, you are able to leverage buying power to open both long and short positions. Liquid offers up to 25x leverage which means you can open a USD2,500 position with USD100 in deposited margin. The main advantages of margin trading are increasing buying power through leverage, trading assets you don’t directly own, and the ability to short assets. We already covered the first two advantages, so let’s talk about shorting. Buying and selling on a typical spot exchange requires you to hold the underlying asset. For example, selling BTC for USD is only possible if you already hold BTC. Trading on margin allows you to “long” or “short” an asset. Traders looking to open a long position will borrow an asset with the hope of selling it at a higher price in the future. Similarly, traders who want to short an asset will borrow at a higher price with the hope of buying back and keeping the price difference following a price drop. Let’s look at a real-world example of shorting. David is a trader on the Liquid platform and currently only has BTC and JPY in his wallet. He gets an alert that ETH has reached overbought conditions and he is expecting a price retracement in the near future. Since David doesn’t hold any ETH, he decides to open a USD5,000 margin short position at 0.05% interest, with his BTC and JPY holdings as collateral. David ladders ETH/USD short orders between USD228 and USD230 (USD228.75 average) with a stop loss at USD235. A few hours later, the price of ETH drops to USD212 and David closes his order with a 7.3% gain. David’s resulting profit is around USD365 minus trading fees and the interest on the loan. Margin trading with leverage is a high-risk, high-reward endeavor. To prevent asset lenders from losing money, exchanges implement margin coverage, margin call and order liquidation protocols for margin traders. On Liquid, margin coverage is expressed as a percentage that is calculated by dividing equity by required margin. When margin coverage drops below 120%, a margin call alert will be sent via email. At this point, you must take action to move margin coverage above 120%. To do this, you can either deposit more funds to increase your equity, reduce your position, or hope that the market moves in your favor. If the margin coverage drops below 110%, a liquidation order will automatically execute, resulting in significant losses. Let’s take a look at an example of how margin coverage, margin call and liquidation works in the real world. Frank wants to margin trade and deposits USD1,000 as margin collateral. He uses 10x leverage to open a 1 BTC long position at USD7,500. After the order is opened, Frank’s required margin is USD750. A few hours later, the market goes against Frank and the price of BTC drops to USD7,399. At this point, Frank’s equity drops to USD899, which puts his margin coverage at 119.87% - margin call territory. Instead of depositing more funds or reducing his position, Frank decides to hold out because USD7,399 seems to be a good support area for BTC. Unfortunately, the trend continues downward. At USD7325, Frank’s equity is reduced to USD825, which puts his margin coverage at 110%. As per Liquid’s margin coverage rules, Frank’s order is liquidated resulting in a loss of over USD750. As you can see from the example above, margin trading can be extremely risky. In order to succeed with this form of leveraged trading, it’s important to develop good habits like using a stop loss and avoiding emotion-based trading. A stop loss is an order that triggers a market buy or market sell when a specific price is reached. When designing a risk management strategy, traders typically allow for 1-2% risk on each trade. For example, if Alice has a 2% risk tolerance and longs 1 QASH at USD10, she would place a stop loss at USD9.80. If the price of QASH falls to USD9.80, a market sell order will execute resulting in a maximum USD0.20 (2% of USD10) loss if there is enough liquidity and no price slippage. Trading is all about probability and it’s nearly impossible to win 100% of the time. By setting a stop loss, you can predictably account for potential losses and prevent complete liquidation from an unexpected spike in price. Remember, this is crypto and absurd price squeezes and spikes happen all the time. Spikes of 10-15% are not uncommon in crypto, and even those are more than enough to cause huge losses and margin calls for over-leveraged traders. Remember, trading on margin exaggerates both gains and losses. A 1% move down in spot price results in a 5% loss if you’re trading with 5x leverage. Similarly, a 2% move up would result in a 10% gain. Knowing this, it’s not difficult to imagine how margin trading without stop loss orders can completely wipe out your capital. Moral of the story: never trade without a stop loss if you don’t want to wake up to an account balance of zero. Leverage is a beautiful concept, but it’s also the leading cause of forced liquidations. Many inexperienced traders don’t realize that liquidation price is directly correlated with leverage. In Frank’s trading example, he chose to open a USD7,500 position (1 BTC = USD7,500) at 10x leverage. This order saturated 75% of Frank’s margin allowance, which left very little wiggle room in terms of price movement to the downside. As a result, Frank’s liquidation price for this order was USD7,325, a mere 2.3% decrease from USD7,500. If Frank opened a USD3,000 position (1 BTC = USD7,500) at 5x leverage, his margin allowance would be only 60% saturated. More importantly, his liquidation price would move to USD6,650, which is 11.3% away from USD7,500. After realizing the correlation between leverage and liquidation price, it’s easy to see the importance of keeping your emotions in check. The ability to trade with 10x or 25x leverage can lead to dreams of crazy profits, and this dissociation from reality ultimately leads to financial run for many over-leveraged traders. Remember this: if it were easy, everyone would be filthy rich. In short, there’s nothing inherently bad about margin trading. It’s a useful tool that can produce accelerated profits when used correctly without emotional bias. Now that we’ve discussed the pros and cons of margin trading, let’s talk about how to incorporate this tool into your overall trading strategy. As we discussed earlier, trading on margin requires borrowing funds from a lender to increase leverage. In exchange for the increased buying power, you must pay a daily interest rate to the lender. Interest rates are volatile and can fluctuate based on market dynamics. In periods of high volatility, interest rates typically increase as more traders take out loans to increase leverage and take advantage of the price action. Thus, it’s inadvisable to hold margin positions long term unless you’re comfortable with extended interest-accruing loans. For the majority of traders, margin and leverage is best suited for daytrading and scalping. Daytraders typically trade 30-minute to 1-hour timeframes with low leverage, while scalpers tend to trade 1-minute to 5-minute charts with high leverage. While these two trading techniques are fundamentally different, they do have one thing in common: daytraders and scalpers do not keep open positions overnight. Thus, these lower timeframe traders are able to reap the benefits of margin trading without exposure to long-term accrued interest. Trading volume is a measure of market activity and represents the number of asset shares transacted between buyers and sellers in a given period of time. Established high-volume trading pairs have more liquidity, which means they are usually less prone to highly volatile price action. In margin trading, unexpected flash pumps or flash dumps can easily trigger margin calls and order liquidations. Thus, it can be beneficial to find high-volume trading pairs if you want to trade on leverage. Now that we’ve established margin trading is best for daytraders and scalpers, let’s discuss how margin trading can be used to build long-term holding positions. Over the last five years, Bitcoin and its underlying technology, blockchain, has seen exponential growth both in value and adoption. Today, Bitcoin and other cryptocurrencies have formed a completely new asset class that can be traded on an exchange and held as a long term investment. Everyone has their own strategy when it comes to managing their cryptocurrency portfolios. Due to crypto’s highly volatile nature and relatively small market cap when compared to traditional markets, some people avoid risk by buying on dips and holding long-term. On the other hand, there are professional traders who live and breathe volatility and see crypto’s extreme price action as a way to make a lot of money in a young and maturing market. Lastly, there are those who like to do a little of both by allocating a percentage of their portfolios to trading - usually 25-50% depending on personal risk tolerance. Margin trading can be a very useful tool for people who allocate a percentage of their portfolios to trading. For example, let’s say Bob decides to move 25% of his USD10,000 portfolio to his margin account on Liquid. By using a reasonable 4x leverage on Liquid, Bob is able to trade his whole portfolio size (USD10,000) while maintaining USD2,500 in available margin. In this scenario, Bob has the opportunity to grow his portfolio at a much faster rate, provided he makes smart and profitable trading decisions. Furthermore, margin trading enables Bob to open short positions to capitalize on both up and down price movements - something that isn’t possible with un-leveraged spot trading. Hopefully this post has brought some clarity with regard to the mechanics, advantages, and disadvantages of margin trading. Here’s a quick recap of the most important margin trading lessons.